Commercial Bank of Ceylon PLC won the coveted ‘Cyril Gardiner Memorial Trophy’ Gold Award for Overall Excellence in Annual Financial Reporting at the grand finale of the 53rd Annual Report Awards Competition organized by the Institute of Chartered Accountants of Sri Lanka (CA Sri Lanka). Hayleys PLC came in second, bagging the silver award for overall excellence in financial reporting, while Diesel & Motor Engineering PLC (DIMO) won the bronze award in the same category. Leading blue chip companies, conglomerates to SMEs and small time community groups were honoured at a gala ceremony held on 05th December 2017 for their excellence in financial reporting, which was held under the patronage of Hon. Prime Minister Ranil Wickremesinghe. Commercial bank also won gold under the Management Commentary Award, while DIMO won silver and People’s Leasing & Finance PLC won bronze. The Corporate Social Responsibility Reporting category gold award was won by People’s Leasing & Finance, while Mercantile Investments & Finance PLC won the silver and National Development Bank PLC (NDB) won the bronze. NDB also won gold for Corporate Governance Disclosure, while Union Assurance PLC won silver and Hatton National Bank PLC (HNB) won bronze. DIMO also won the gold award for Integrated Reporting, while L B Finance PLC won silver and John Keells Holdings PLC (JKH) won bronze. The Best Disclosure on Capital Management in the Integrated Reporting category was won by L B Finance which was awarded with a gold, while Commercial Bank received the silver and DIMO bagged the bronze. Peoples Leasing & Finance won gold for Best Disclosure on Business Model under the Integrated Reporting category, while JKH won silver and Hayleys won bronze. Under the sector awards, Hayleys won gold for the Diversified Holdings for groups of above 10 subsidiaries, while DIMO won gold for the Diversified Holdings for groups up to 10 subsidiaries. 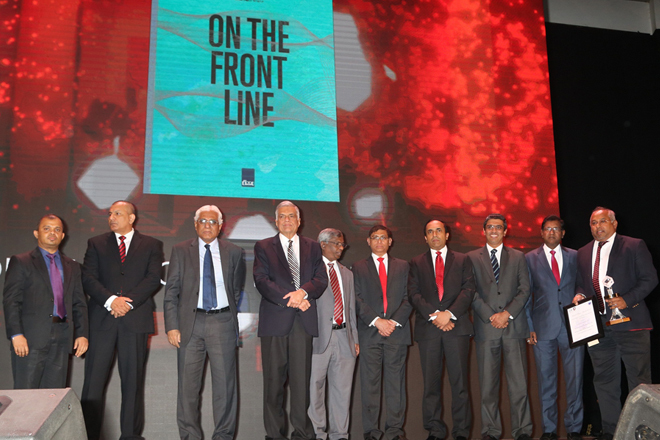 Commercial Bank bagged the gold for Banking Institutions sector, and Bank of Ceylon won the gold under State Banks. Nawaloka Hospitals PLC won gold for Healthcare Institutions, and Hayleys Advantis Limited won the gold for Service Organisations. Sri Lanka Telecom PLC won gold for Telecommunications Companies, and the National School of Business Management Ltd., won gold for the State Corporations & Statutory Boards category. United Motors Lanka PLC won gold under Motor Companies, and L B Finance won gold under the Finance Companies & Leasing Companies (Total asset above LKR 20 Bn) sector, while Singer Finance Lanka PLC won the gold for the Finance Companies & Leasing Companies (Total asset up to LKR 20 Bn) sector. Singer Sri Lanka PLC won the gold for Trading Companies, and the Nuwara Eliya Hotels Company PLC won gold under Hotel Companies. Talawakelle Tea Estates PLC won gold under the Plantation Companies, and Dipped Products PLC won gold under Manufacturing Companies with a turnover of above LKR 5 Bn, while Alumex PLC won gold under Manufacturing Companies with a turnover of up to LKR 5 Bn. HNB Assurance PLC won gold under Insurance Companies, Keells Food products PLC won gold for Food & Beverages Companies, Berandina Microfinance Institute (GTE) Ltd won gold for the Not for Profit Organisations including NGOs sector, while Seylan Developments PLC won gold for Land & Property Companies. Access Engineering PLC won gold for Construction Companies, while Laugfs Gas PLC won gold under Power & Energy Companies and Lankaclear (Pvt) Limited won gold for the Small and Medium Sized Entities sector. Speaking at the event, President of CA Sri Lanka Mr. Lasantha Wickremasinghe said transparency, accountability and good governance are vital for both the public and private sectors, as it is interconnected to a country’s growth and development. “The national government under Prime Minister Ranil Wickremesinghe was built on the premise of good governance, and as a responsible professional organisation in the country, CA Sri Lanka too has implemented a series of initiatives from within the institute to enhance good governance which will reflect on the accounting profession, its professionals and ultimately the country,” he said. Mr. Wickremasinghe said that good governance, transparency and accountability should not only be expected from a government, and instead even professionals, as citizens of this country, must learn to be responsible towards this country. He also recalled how the institute adopted the Responding to Non-Compliance with Laws and Regulations (NOCLAR) standard in Sri Lanka, on the very same day it became effective internationally, to ensure every member of CA Sri Lanka was in line with the latest international ethics standard. “I personally believe that NOCLAR is a revolutionary ethical requirement that all professional accountants must adhere to, specially as it is a standard that has been adopted in the public interest in the event of any non-compliance or suspected non-compliance with laws and regulations,” Mr. Wickremasinghe said. He added that his institute was creating change not by word but by practice. Speaking at the event, Chairman of the Annual Report Awards Committee Mr. Sanjaya Bandara said 140 companies took part in this year’s competition, representing multinationals, conglomerates, and even NPOs and NGOs. “Selecting the best is never an easy task, and in our quest for excellence we carried out a three tier process of evaluation in which more than 300 resource personnel were involved to ensure we selected the best reports,” he said. Explaining further, Mr. Bandara said that during the first tier the reports were evaluated by a technical marking panel comprising of 230 chartered accountants, and during the second tier, which was called the ‘industry expert marking panel’ some sixty members representing diverse industries were brought in who broadly looked at economic, social and industry specific disclosures made in the annual reports. “Finally, the annual reports were evaluated by the final panel of judges headed by the Governor of Central Bank Dr. Indrajit Coomaraswamy who was supported by a distinguished panel of judges,” he added.